Happy 4th Forever Home Anniversary Sophia! It has been four years ago today that Sophia and I found each other. I made this poster a few months ago and decided to use it today. 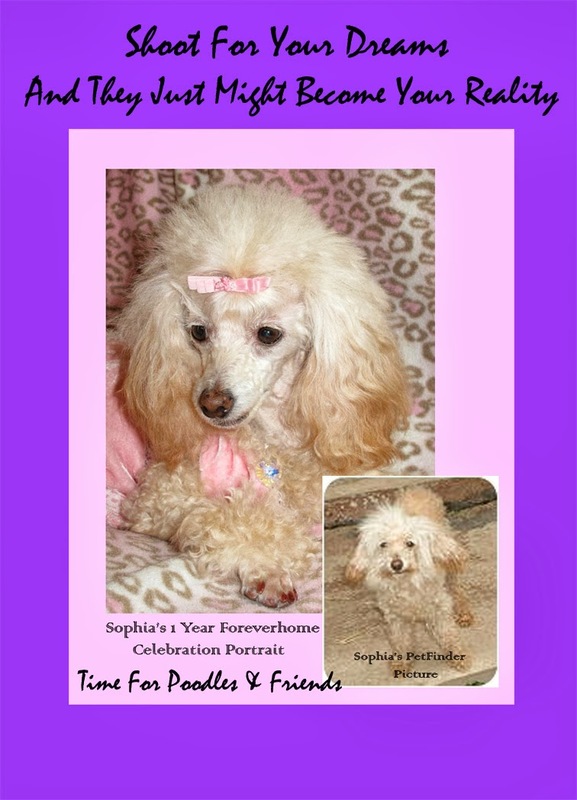 Four years ago today, I met Sonja (of Riverhill Rescue) and a small and wary Apricot Poodle that I found on Petfinder. I had to wait a couple of days longer to get the little poodle than I wanted. Sonja insisted on taking her to the groomer so she would look less like a ragamuffin and more like a Poodle. For Fraggle (that was her name), this probably was just one more trip in her life. She had spent her short life in the puppy auction and puppy mill system. However, she had some good luck and managed to find her way to Riverhill Rescue and then to me. Life with Sophia has been a challenge at times. At the time of her adoption, I had never heard of puppy mills and all that goes with them. Sophia got out pretty early, so she does not have the severe emotional damage that I have heard of other owners facing. Little did I know the direction my life would take because of one little Apricot Poodle.